Augmented reality (AR) has shown to be a facilitating tool and motivation to work with children, young people, and adults in times of recreation (entertainment) and also in classrooms (formal spaces of education). Augmented reality provides a different way of learning with the support of different technologies such as computers, tablets, and smartphones. It allows easy visualization and manipulation of the study object, reproducing the complex data in the form of objects and three-dimensional texts, increasing the student's ability to perceive, which is stimulated by the possibility of interaction with the interface. 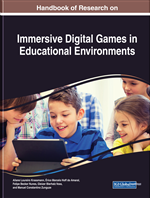 This chapter aims to present the different augmented reality technologies used in education and also to discuss methodologies for the use of augmented reality applications to improve the teaching and learning process. Augmented Reality (AR) was first used in the 1990s in pilot training applications, providing a mixed reality, that is, a real-world junction with virtual objects. Unlike virtual reality, which allows the user to interact with a totally synthetic environment, isolated from the real, augmented reality consists in superimposing computer-generated digital three-dimensional objects in the real environment around them by means of some technological visualization device (Milgram & Kishino, 1994). Since 1997, the researcher Ronald T. Azuma has already seen an evolution in the forms of interaction with augmented reality systems, proposing the stimulation of other human senses (Azuma, 1997). Augmented reality increases the user's visual experience. However, several researchers such as Eck et al. (2013), Weir et al. (2012) and Narumi et al. (2010), are developing hardware and software to enrich the multi-sensory user experience involving the other senses: hearing, touch, taste and smell. Given the fast pace of the insertion of augmented reality in areas such as education (Chen, Liu, Cheng & Huang, 2017), medicine (Sutherland, Hashtrudi-Zaad, Sellens, Abolmaesumi & Mousavi, 2013), rehabilitation (Corrêa, Assis, Nascimento & Lopes, 2015) publicity and entertainment (Barakonyi & Schmalstieg, 2005), there has been a continuous emergence in recent years of new courses, new development tools, companies and research groups interested in the use of augmented reality technology and its applicability in teaching. Promoting predominantly visual interaction, researchers are investing efforts in the development of hardware and software of augmented reality which allow the user’s interaction to the virtual environment through other human senses (speech, hearing, smell and touch), as well as gestures. This multisensory interaction stimulates human perception and demonstrates the omnipresence of new technologies, enabling the development of applications in various areas of expertise and providing innovative and more interesting human-machine interfaces. The development of computational environments, with more intuitive interfaces and a high level of interaction, allows users to carry out their activities without difficulties, as well as to help spreading the technology to other areas. In Education, for example, the traditional method of education known as face-to-face has been transformed with the development of Learning Management Systems and the need to use new and interactive tool to engage and motivate students. In this way, augmented reality becomes an important teaching support tool enabling visualization and manipulation of interactive 3D models and encouraging students to participate in a more creative and fun process (Souza-Concilio & Pacheco, 2013). Because it is easy to develop and has a relatively low acquisition cost, augmented reality applications have become an important resource to assist educators, both in the distance learning process (Liarokapis, 2012), and in the hybrid methodology of teaching and learning process (Albrecht, von Jan, Sedlacek, Groos, Suerbaum & Vonberg, 2013). The power of augmented reality as a learning tool is its ability to “enable students to see the world around them in new ways and engage with realistic questions in a context in which students are already connected” (Klopfer & Sheldon, 2010 as cited in Dunleavy & Dede, 2014). Augmented reality applications connected to contents can create learning experiences and endless learning possibilities, promoting better interactivity and motivation, while the user manipulates virtual and real worlds in real time using all one’s senses. The beauty of augmented reality is that learning experiences can be as easy or as complex as you wish, allowing to create or download many applications already connected to various contents. Location-Based Augmented Reality: Marker-less augmented reality applications that use information as geolocation for the system to provide virtual information. Marker: An image printed on a piece of paper which is captured by the camera and represents the virtual object to be displayed. Virtual Reality: Technology that provide virtual immersive environment for the user to interact using special devices. Blended/Hybrid Learning: A combination of traditional and online learning, enriching the face-to-face initiative with technological and online resources for the students to be more engaged. Handheld Devices: Portable and mobile devices, firstly known as palmtops. Augmented Book: A combination of physical book and augmented reality technology which allows the user to interact with additional three-dimensional information related to the content of the book. Augmented Reality: Technology that allows virtual information to be visualized and manipulated mixed with the real world around the user.